I’m quite competent at using my heroes, but absolutely horrible when it comes to things like rotations and team coordination. What are rotations? What rotations and strategies do I want to use with each type of character both in 3v3 and 5v5? What items should I use to help in early game? For example, I heard that there’s certain items that are essential for early Captains, Junglers and roamers. What are they? I never built any special items to help Jungle, and always stuck with whatever build I was planning on using. When is it a good time to take objectives? I usually just go for the Kraken/Crystal Sentry/Ghostwing/Blackclaw whenever the enemy team is wiped out. Are there only specific situations where each one is useful, even if the enemy is dead? When should I go for the Ghostwing over the Blackclaw? I play CP Syke (main), WP Kensei, CP Lance, WP Krul, WP Kinetic, WP Geen, WP Rona, CP Anka, CP Varya, WP Tony, CP Celeste, CP Anka, CP Alpha and am learning CP Lyra. 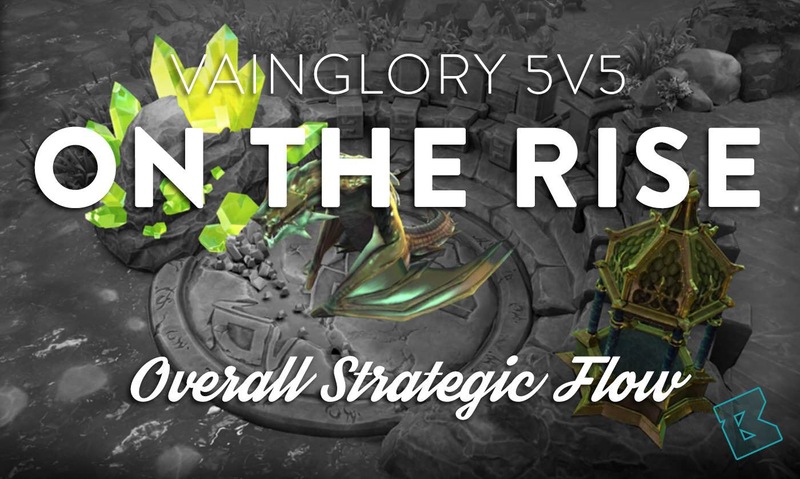 For example, quite a number of your questions about 5v5 are answered in this topic by @idmonfish, who has been playing VG since the beginning and who has coached the game professionally. There is a TON of expertise here – we have a lot of veteran players and many who are in the very highest ranks in the game – and these folks are great about sharing their knowledge. To get started, try the search feature (magnifying glass icon in the header) – if you click “options” you can get very selective in how you search. Thanks. That sounds like a nice alternative to writing an essay whenever I need advice. I’ve been keeping the topic you linked open in a tab since some days, because yeah, it’s really solid quality advice, all condensed in a single place. And recent/up-to-date. That said don’t be afraid to ask questions. I hear CommanderWarf streams on twitch are also pretty good. I think my suggestion would be that you have told me a number of heroes you feel confident with which is great, however I think what you need to do is to pick a role to main and one or two secondary roles. That way you can focus in on what that role needs to achieve - which role do you find yourself playing often? Essentially, they’re your movement paths around the around the map to farm and help out allies. You’ll constantly be focusing on repeating the path, hence the “rotation” name. What rotations and strategies do I want to use with each type of character both in 3v3 and 5v5? Carries have the easiest rotations. They simply focus on staying in the lane to push or defend turrets, only moving down to the jungle as needed (for example, to help contest the middle treant or to help out in teamfights there). Junglers focus on taking the jungle camps, be it their own team’s or the enemy’s, first and foremost, then moving up to the lane to gank the enemy laner and/or help push. There are two main rotations for junglers; outside camps to inside camps, or vice-versa. Outside to inside has you take out the two jungle camps closer to your base first, then the two camps closer to the Kraken/Gold Miner area. This rotation gives you more convenient access to the lane after clearing the camps, but leaves your inside camps vulnerable to steals. Inside to outside (the more popular of the two) has you do the opposite, where you start with the camps closer to the Kraken/GM area, usually with the double bear camp. This rotation allows you contest the middle treant right when it spawns and makes your inside camps less prone to be stolen, but doesn’t allow you to the lane as fast after clearing the camps. However, with strong earlygame heroes, you should focus on getting early kills and stealing farm over clearing your own camps. Captains go wherever they are needed on the map, but they typically start by rotating alongside the jungler. 5v5 rotations are similar to those in 3v3, just accommodating for the larger map. Laners focus on staying in their lane to push or defend for the most part, usually only rotating out of their lane to help out allies or to get a WP/CP buff. Mid laners should try not to rotate to other areas often, as mid is the most important lane. Junglers focus on taking jungle camps and rotating to the lanes that they are needed in. The two main rotations for 5v5 junglers are bottom to top camps or vice-versa. Bot to top allows you to get to the top or mid lanes easier after clearing the camps, as well an early WP buff should you take the treant, while top to bot allows you to get to the bot lane easier and provides an early CP buff should you take it. Captains still go around to where they are needed, but here they typically start in the mid lane to help defend it. I heard that there’s certain items that are essential for early Captains, Junglers and roamers. What are they? For captains, is one of the best early items. Its teamwide heal is extremely helpful, especially earlygame. For junglers, Stormguard Banner is the best initial item because it makes farming and stealing enemy camps significantly easier for most heroes. Laners really don’t have an essential early item. Book of Eulogies is helpful for laning because of the sustain it provides, but it’s really only best for WP heroes. When is it a good time to take objectives? Really, only when it’s safe to. You don’t have to have the enemy team aced in order to take objectives. Given proper vision and teamwork, you can do it at any time. Rotations, like @DIMTI said, are movements around the map outside of your lane to gank, help to defend a turret, or take an objective. As for when it is safe to take blackclaw or ghostwing, it is best to take them either when you won a fight decisively and everyone is healthy enough to take it or if you have strong vision control around one of the dragons and you can have the jungler and the closest laner start it with other people coming in to finish it when it’s low so the enemy team cannot react. Just be careful when you attempt the latter. 3v3 is very straightforward with my recent experience playing the mode a few days ago with its strats. It’s a very jungle-centric meta where being able to out-farm the enemy jungler or stealing their camps and counter-rotating them is very key to winning. At the start of the game I usually see teams go near the elder treant to engage and try to get the elder kill for an early advantage and the laner would lane with the captain while the jungler farms. It’s far more geared towards individual skill than 5v5 as carrying a team by yourself is generally easier, but of course if the laner can rotate into jungle effectively and find good ganks that definitely helps, but jungle is definitely the most important role in that mode. If you are able to control the jungle you pretty much control the game. Mid Lane: You have two choices: Take the crystal treant first, or clear lane then try to get the crystal treant. If you choose the former it would be best to have your captain help you take it as well in order to keep a higher dps and capture it quickly. When taking the treant try to leash it to the left wall by the treant’s spawn to make it harder for your enemies to gain vision over it as well as hit it with skill shots. Once it is where you want it to be you can also move across it to block and incoming skill shot like a Yates pull that could otherwise steal it from you. Jungle: If you’re Inara, which I doubt unless you’re high tier, go for the enemy jungle and wait for them to get their treants low and use her perk to jump on the treant to steal it and run away. Stormguard banner allows you to burst down treants very effectively, making her one of if not the best early game jungler in the game. Also, since your perk grants you vision of treants, you do not have to place a scout cam that would otherwise give away that you’re nearby. If the enemy goes straight for their gold oak, you can try to steal that too. Other junglers go for banner too since it grants very high wave clear so you can farm up as fast as possible. Other than Inara, other junglers like Taka can also invade so long as he has a bit of help doing so. Captain: Some captains also go for banner. One that definitely goes for it early on is Lyra. it bolsters her healing a bit and gives her some extra dps which is especially useful for stealing camps due to her range and usually mid laners and their captains won’t build SGB, so you’re safe to burst those treants down. However, kepp in mind you need to have vision control over the enemy crystal treant to be able to steal it effectively. Other captains will build oakheart and shield for fountain or oak heart and boots to go a bit faster which helps for rotating. Mid Game: You will generally have the jungler looking for kills, but the biggest goal for the team should be taking turrets. you can have mid lane push their lane and rotate to either top of bot lane to help take a turret. It is best to have 4 people in one lane to hard push a turret especially with the CC the captain can provide or if you are playing a heavy late game comp you might want your allies to rotate defensively to lose as little turrets as possible to allow you to survive until your team is online. Ghostwing is a great objective to try and gain control of as it helps for this exact purpose both offensively and defensively. You get a barrier and extra objective damage which is big in the mid game. Late Game: Team fights are very important at this stage. Once you get a few kills in a fight and you have enough people up, it is generally safe to go for blackclaw. However, make sure you have vision at black claw and around it as enemies could potentially steal it with a well times skill shot. However, if one or more of the enemy armories are exposed/destroyed and you get a bunch of kills with your team relatively healthy in the late game with long death cool downs you can skip black claw altogether and push in with your team since you do not need anything to tank turret hits and bring down the backdoor shield. Try to minimize mistakes as they can cost you the game at this stage. This is what I have from the top of my head. There are other aspects like drafting strategies and specific matchups, but over time you should get the jist of everything. You wrote that it was unlikely I’d be Inara if I wasn’t in a high tier. Why is that? Another point about Kraken and Blackclaw which I find many players do wrong : An ace does not necessarily means you should go for it. If your team needs to cross half the map to kill it, it will be safe to take it, and you’ll end up fighting full team + kraken/blackclaw vs full team, which is an comfortable position to be in. But if you and your minions are already near the entrance of the enemy base, and you just need to take down 1 turret + armory(5v5) or 2 turrets (3v3) + the crystal with the enemy respawn timers being at 30-40sec, it may well be a guanranteed win instead of just a “comfortable position” if you directly attack the base.